When you look at your skin, is it as soft and full and as fresh as you would like? Do you have age spots, acne scars, fine wrinkles and flaking skin? Are you pressed for time and need a solution that can be done in a lunchhour with no downtime? If so, Diamond peels are designed to help your skin. 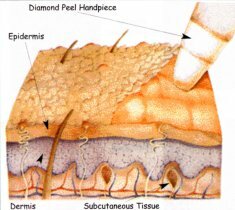 Removing skin from the surface layers has been around for many years, but diamond peels revolutionise this concept. With diamond dermabrasion not only are the useless top dry flaky skin cells removed, but the circulation to the skin beneath is stimulated, replacing older skin with fresh, younger cells and stimulating collagen formation. It is a great way to condition your skin in a non-surgical non-invasive way, and results can be seen after the first treatment. 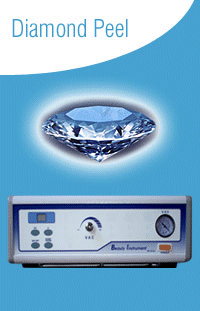 With a diamond peel there is no downtime and each treatment session is only 60 minutes. Diamond peels can reduce crows feet as well as fine lines around the face and mouth, lips and neck. It can even help with acne scars.